One of the aspects of reenacting I find appealing is trying to do novel activities. 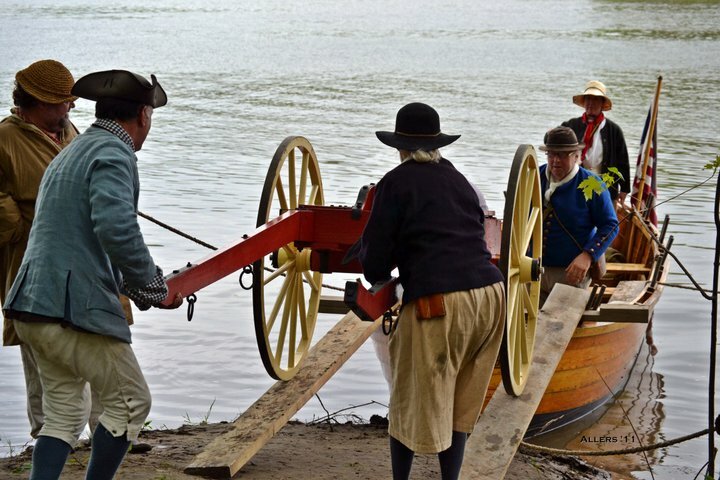 Our group owns a 1 1/2 pounder cannon with a French-style shaft carriage. 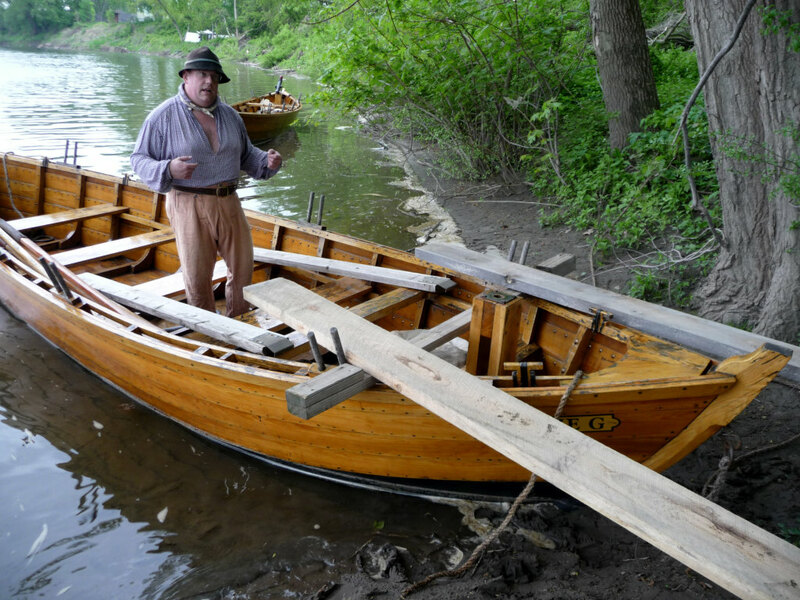 We also work and play with two replica bateaux (18th century cargo boats), owned by the Mabee Farm Historic Site. 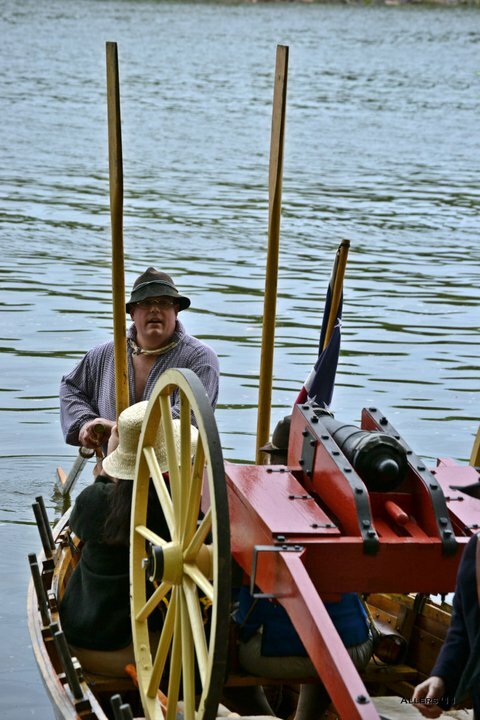 I greatly enjoy working with the boats, whether rowing or sailing, and I enjoy hauling the cannon around. 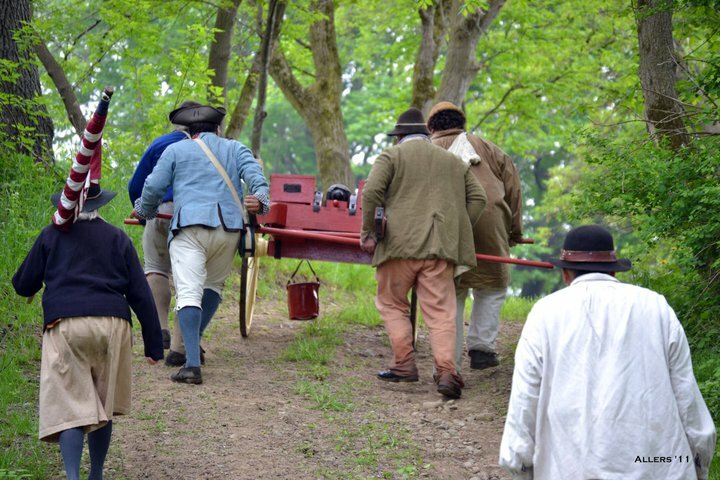 For more information on the cannon carriage, see here. 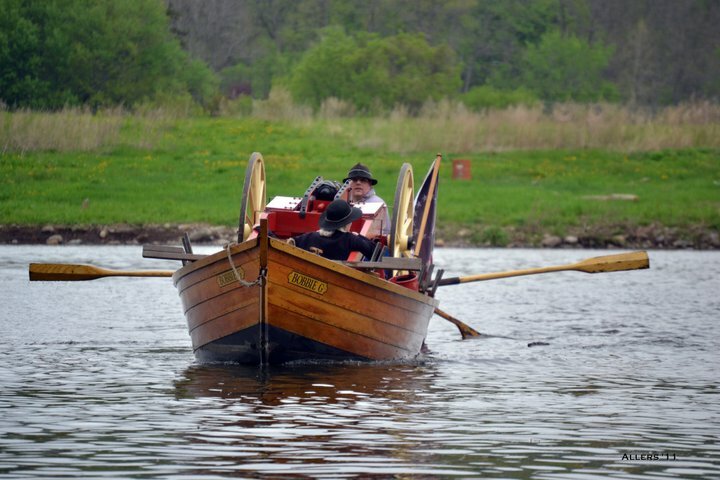 For more information on the bateaux, see the writeup from the one of the Big Row trips. 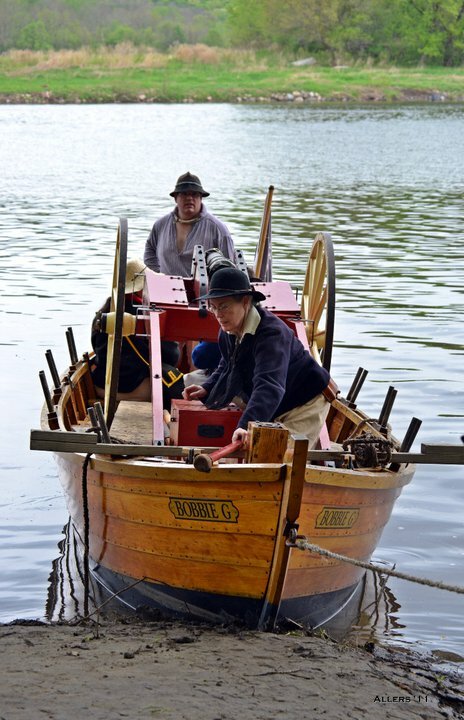 Kevin's brilliant idea was to combine our interests and to transport our cannon across the river in one of the bateau. This had many virtues - the Farm owns land on the other side of the river and was itching to see it used. Our cannon was freshly painted and we were eager to see it used. 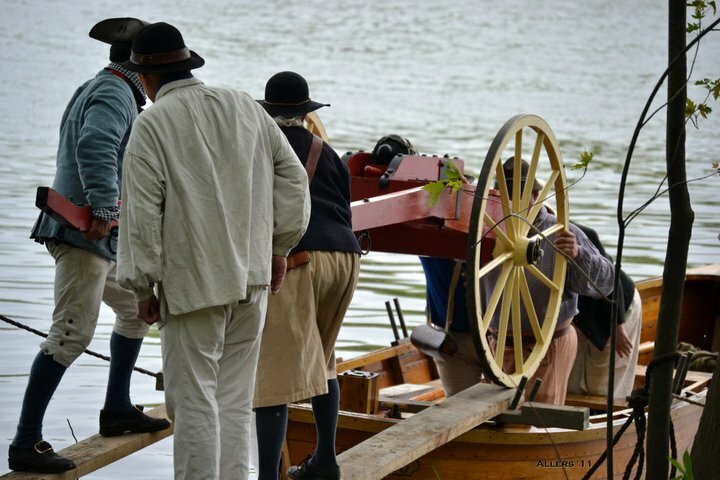 We were somewhat bored with "rowing about in circles" as part of the reenactments, and thought that there should be something more interesting and relevant to do. Also, Kevin had found a period explanation of loading the cannon into a boat. I had also thought about how to do this with our cannon and our boat. Our technique would be similar to the period methods, but, having a lighter gun and smaller boat, our methods wouldn't be identical. We contemplated pulling the wheels to drop the center of gravity while the cannon was in the boat, but this turned out not to be necessary. 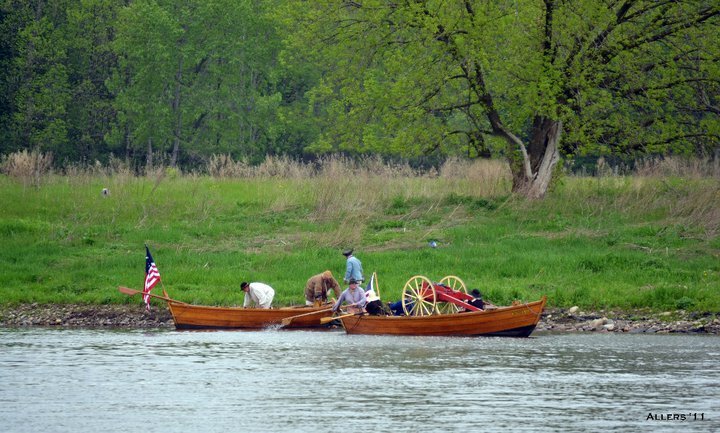 In preparation of moving the cannon, we had brought two 10' 2x10 rough pine planks down to the river. We also had a cross-piece from the boat trailer and the two ramps from the cannon trailer. The water had come up several feet in the night, so we no longer had to cross a mud flat to get to the boat. We did a practice run in the morning, loading the cannon in to the Bobbie G and then taking it back out again. From this, we learned where we need to put people and what boards we actually needed. Basically, the front thole pins turned out to be perfectly located to brace everything we needed. We put a cross timber across the front of the boat, then put the two 2x10 pine planks as ramps from the group up to the cross timber. The front thole pins prevented these ramps from sliding off the boat, and the cross timber kept them close to flat for the cannon. Inside the boat, I put the trailer ramps to lead back down from the cross timber to the thwarts. Ultimately, we got two more boards to span the thwarts to let the cannon rest upon within the boat. 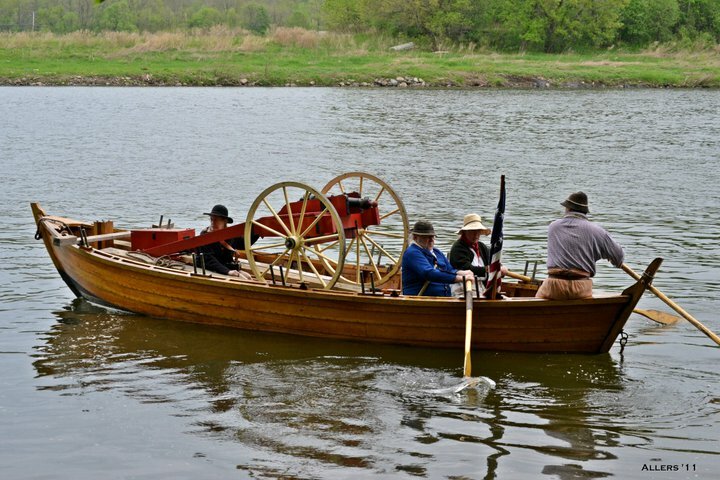 Furthermore, we learned that we needed two rowers and the steersman in the boat before we started to load the cannon, as it was awkward to get by the cannon. We also decided it would be best to have two handlers, one each of the stern and breast lines, to make sure that the boat didn't swing during the operation. 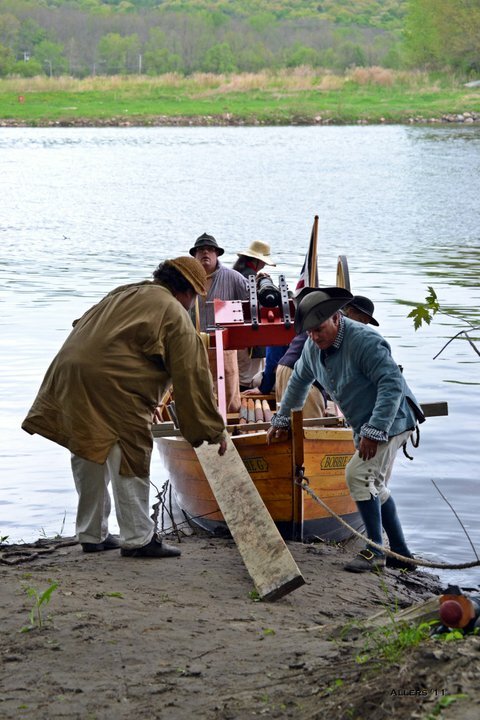 After loading the cannon and taking it back off, we then rowed the DeSager across the river and looked for a suitable landing spot on the far side. We had a total crew of seven for this: Kevin, Bill, Bob, Peggy, Sarah, Dean, and myself. Although we could have done it with four people, I really wouldn't want to. Shortly after lunch, we began the process for real. First, we fired off the cannon with Bob serving as gun captain. We then loaded the cannon into the Bobbie G, after which we loaded in the ramps and all of the cannon tools and the side magazine. With Peggy in bows, Kevin and Sarah rowed across the river (with myself steering). The DeSager followed with Bill, Bob, and Dean. 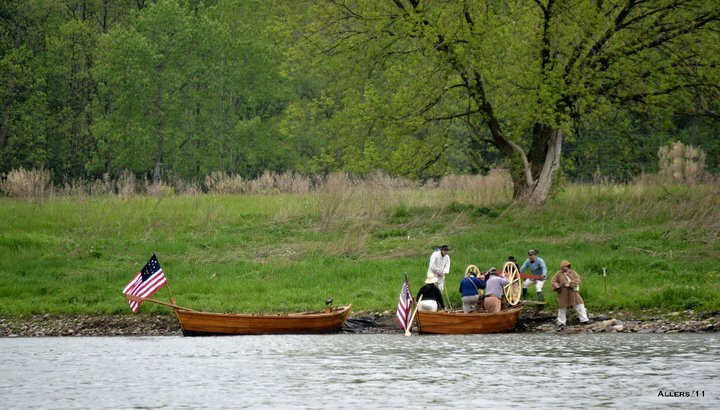 On the far shore, the DeSager landed first, then helped receive the bow of the Bobbie G. With two people holding the mooring lines, we deployed the ramps, rolled the cannon off the boat, and clambered ashore to work the gun. 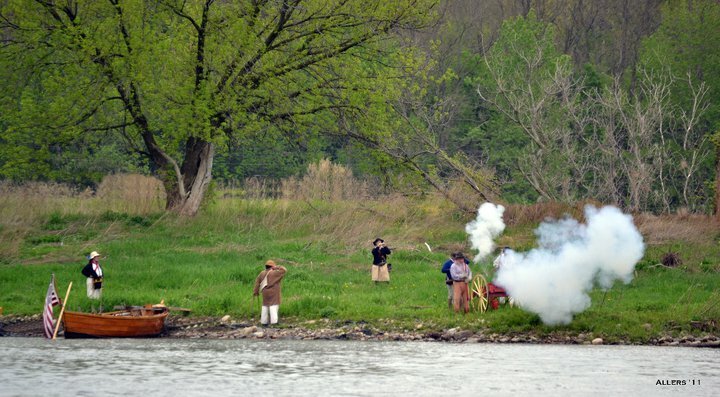 We moved the cannon only a short distance, then fired it four times (we had answering fire from cannons at the Farm). After this, we reversed the whole process, putting the cannon back on the boat, reloading ramps and tools, and returning to the Farm. All of this went as well as we could possibly hope for. If we had been so inclined, we had the cannon back on the Farm side in time enough we could have joined the mock battle. The whole process wasn't especially hard, but we were glad to take it slow. 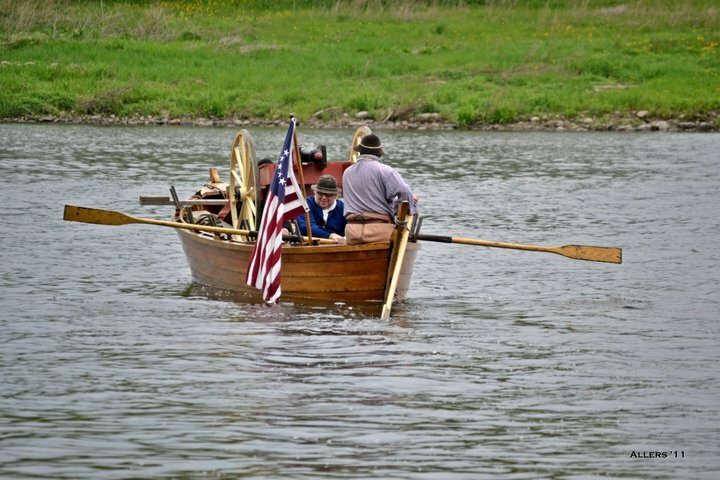 I would not have wanted to load the cannon in the DeSager, as it is narrower than the boat we did use, the Bobbie G.
One Bateau and all normal oars, etc. One cross plank used to stabilize all the ramps. Our cross plank had a block at each end, which turned out to be helpful for keeping the ramps in place. 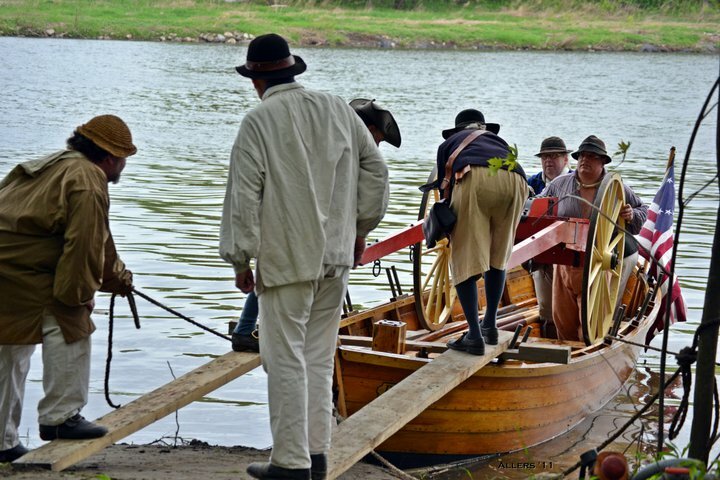 Two long (10' or longer) wide planks to transfer the cannon from shore to the boat. Two short (6') planks to drop the cannon from the bow of the boat to the level of the thwarts. Two broad planks to span at least two thwarts to hold the cannon in the boat. If you were going to do this in any sort of sea, I'd also want a variety of lines to secure the cannon to the boat. 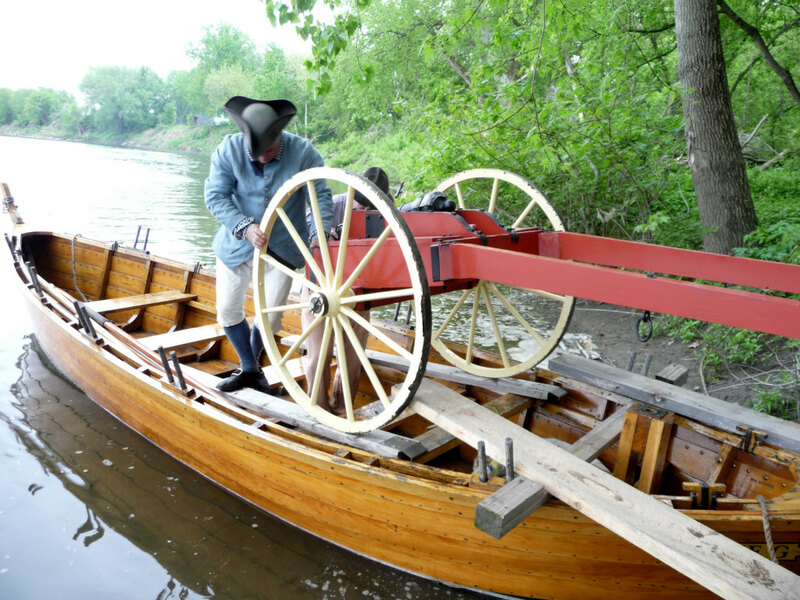 Although the weight of the cannon was high, the boat did not feel like it needed ballast to compensate. Again, in a running sea, I'd definitely want more ballast. 2 handlers to help roll the cannon up the ramps and into the boats. They need to stand on the ramps to make sure the weight of the cannon doesn't tip them at an inopportune time. 2 line handlers. These people hold the breast and stern line to keep the boat perpendicular to the shore. We put one person in the bow of the boat with the cannon to act as our bowsman. The other three people we had crew our second bateau - we could have put them in the boat with the cannon. Although the process feels slow, if you have a good landing spot, it really only takes 10 or 15 minutes for the loading or unloading. I think that, if necessary, we could have pulled the thwarts and dropped the cannon lower in the boat. This might have made it easier to have rowers further forward, but it could have just made the process harder in general. Scanned from Grasshoppers and Butterflies: The Light 3 Pounders of Pattison and Townshend, by Adrian B. Caruana, 1999 printing, figure 29. The original drawing is probably from around 1790. Scanned from The Light 6-Pdr. Battalion Gun of 1776, by Adrian Caruana, 1993 printing, pp. 63-66. The original text and drawings are from the late 18th century. Click on the image for a larger version. These pictures were either taken by Cindy Allers or by Mary Alexander, and are copyright to one of them. Click on a picture for a bigger version. I explain what I want various people to do as we load the cannon in to the Bobbie G.
Bob and I guide the cannon in on the practice run. Loading the cannon. We have three people already in the bateau because we will need them all when we row. The "tricky" part is when the cannon has to be lowered from the loading ramps to the internal ramps. Note the line tenders are also standing on the ends of the ramps to prevent them from tipping upward. Unloading on the far side. Firing the cannon on the far side.